First Pitch: When Will the Pirates Be Recognized as a Good Team? The Pirates came into this series against the Texas Rangers fresh off a four game losing streak. They were swept by the St. Louis Cardinals over the weekend, and fell 1.5 games out of first place. Naturally, they would have been lucky to win one game against the Texas Rangers. The six games against the Reds at the end of the season would also be difficult. They would need to pad the win column against the Cubs and Padres, except there’s only so many games they could be expected to win, despite the Cubs and Padres being bad teams. The 2014 schedule came out today, featuring the Pirates playing the AL East and the Detroit Tigers in interleague play next year. That’s difficult for the Pirates, since they’re going up against a tougher schedule than this year. Each of these cases represents a common opinion on the team. The Pirates are a game out of first place. They’ve been contenders all year. But there’s still this feeling that they’re not a good team. So when they go up against a good team, the view is that they’ve got little to no chance to win. When they go up against a bad team, they’re not good enough to pile up some wins. If they’ve got a tough schedule, it makes it unlikely that they can compete. All of these things are valid arguments if you’re talking about a bad team, or even an average team. But if you’re talking about a good team, the arguments change and nothing matters. Playing good teams? You still can contend. Tougher schedule? Still going to contend. The Pirates are a good team. Sure, no one thinks that after the weekend where they were swept against the Cardinals. Because somehow that cancels out the week before where they took two of three, or the series in August where they took four of five, or the season series where they went 10-9. The Cardinals are a good team, and the Pirates showed this year that they can hang with the good teams. The Braves have been unreal this year against winning teams, thanks in large part to their dominance over Washington (12-4). That said, they’re also 3-0 against Cleveland and 5-2 against the Dodgers. If you break down the rest of the teams, the Pirates have the third best winning percentage against winning teams. The Pirates aren’t the best team in the majors. But you don’t need to be the best team to be a good team. With the exception of the Braves, all of the contending teams in the NL are winning close to 50% of their games. Some teams are slightly above that mark, and some teams are slightly below that. This is what good teams do. They hold their own against other good teams, then beat up on the bad teams. The Pirates have held their own against the good teams in baseball, to the point where they’ve done a better job against winning teams than the Cardinals or Reds. They’re doing what they need to do against losing teams to get to the point where they can realistically contend for the division. So when it comes to tough opponents the rest of the year, or a tough schedule next year, none of that matters. It’s going to be difficult, but the Pirates have shown that they’re a good team. And good teams don’t worry about tough schedules or tough opponents, because they have what it takes to beat those teams. It may sound premature to say this after two wins against the Rangers on the road. But it’s also premature to draw any conclusions on a three game series against the Cardinals over the weekend. The truth lies somewhere in the middle, and the truth is that the Pirates are a good team. It’s time to start realizing that. **A new episode of the Pirates Prospects podcast is coming out tomorrow afternoon with a very special mystery guest. I’m generally not pessimistic about my teams. Like I think Ohio State football will end up 11-1 or 12-0 this regular season. But I’m also not the guy who thinks they have any shot if they get to play an SEC team in the championship or Oregon in the Rose Bowl and losses in those games wouldn’t be disappointing to me. The Pirates are in show me stage. If I’m ever going to buy in on them having any sort of success, my trust needs to be earned. And that has yet to happen. I do trust that NH can build a team now because of the past three seasons and what he started with. I do not yet trust that the team can execute when it matters. Maybe a month from now I’ll earn that trust. I’ve tuned into the Mike Francesa show on the Yankee network for years and I’ll tell you the Yankee fans are just as doubtful and critical as any Pirate fan, doesn’t matter if they just won the WS or not. They may tout their past accomplishments but during the season they have the same issues as any fan. To answer the question, for me the Pirates will be a good team when they finish a season strong, a regular season that is. If they are fortunate enough to be sitting in a similar position next season after making the divisional round this season, my negative thoughts will disappear. A season or two of success will get me at least back to being rational so I can treat the Pirates like the Steelers, Penguins or the Cavaliers. Teams I have seen have quite a bit of success in my lifetime. Your not alone, most of the fans and the media are right with you, the Pirates will be a good team when the fans and the media say they are, not before and no amount of winning is going to change that, referring to the past is a national pastime with far too many. Can anyone talk on the radio or write a column without referring to 20 years of losing? The talent they have in their system and the ability of their management to secure players if they are not already in the system tells a person a lot. IMO, and I have said this many times this year is that the Pirates are a work in progress, anything they win is a bonus to me, I think they are a year or two away, but I sure will take winning this year. I’m a guy whose glass is ……ALWAYS……half empty. No amount of logic will every erase that. So if I doubt or criticize it’s because of a personality flaw. It could be a lot of others are also afflicted. When will the Pirates be recognized as a good team? Great increase in attendance the past few years and the Bucs are already ahead of last year’s pace. After posting winning records in April, May, June, July, and August, why do we still have people anxious to criticize? We went into the All Star Break 19 games over .500 and since then, we are still playing over .500. We left on a 9 game road trip to the House of Horrors in Milwaukee, then St Louis, and then Texas, and we are 4 – 4 so far. We have endured injuries to key pitchers and players and we are still standing and doing better than I ever expected when those injuries occurred. Get over it folks, the 2011 and 2012 teams were successful, but there were huge holes that caused collapses late in the season. This team has much better talent and a unique mix of personalities, and NH stepped up with 2 excellent guys in Byrd and then Morneau to help us down the stretch. And yes, we still have flaws, but we have a system in place that will be feeding better talent for years. The answer to the question is that the Pirates will be considered a good team when the other 18 teams go fishing and leave the business to the final 12! Aside to Foo – looking at the fans attitudes toward the Pirates of the 70’s is not any basis to form an opinion of them now – totally different, from the owners down through the players. Pittsburgh fans love and support certain things. So if the Pirates are better than the Cardinals and Reds against teams with winning records, than must mean they are worse against teams with losing records, right? See how that works? My point is, you can’t just assume you are going to win 2 of 3 or sweep the weaker teams. They all have major league players. The dReds are seeing that with the Cubs hammering them in their park the last two days. People are fretting having to play the Dodgers in the playoffs. Guess what. The Braves have a better record than the Dodgers, and the best home field record in the majors. Nothing will be easy in the playoffs. I don’t see how that works. They’re all beating weaker teams at over a .600 rate. Not sure what your point is then. Pirates are a couple games better than the Reds and Cardinals against winning teams, a couple games worse against teams with losing records. All games count the same in the standings. My point is in the article. The Pirates are a good team, and like other good teams, they beat up on bad teams and handle their own against good teams. OK, thanks. I checked the standings, and you are right. Tim, for me, the pitching will be the key. Like Jim Leyland used to say, “You are only good as your next starting pitcher”. He also used to say, “it’s not WHO you play, it’s WHEN you play them (see last year’s World Series) They play the Rangers today, a game that they are currently winning in the bottom of the ninth. After that, they play the Cubs 7 times. The Reds 6 times and the Padres 4 times. That means that they face Smardjiza, Wood, Jackson and even Arrieta. Those are good pitchers who have at times given the Pirates fits. 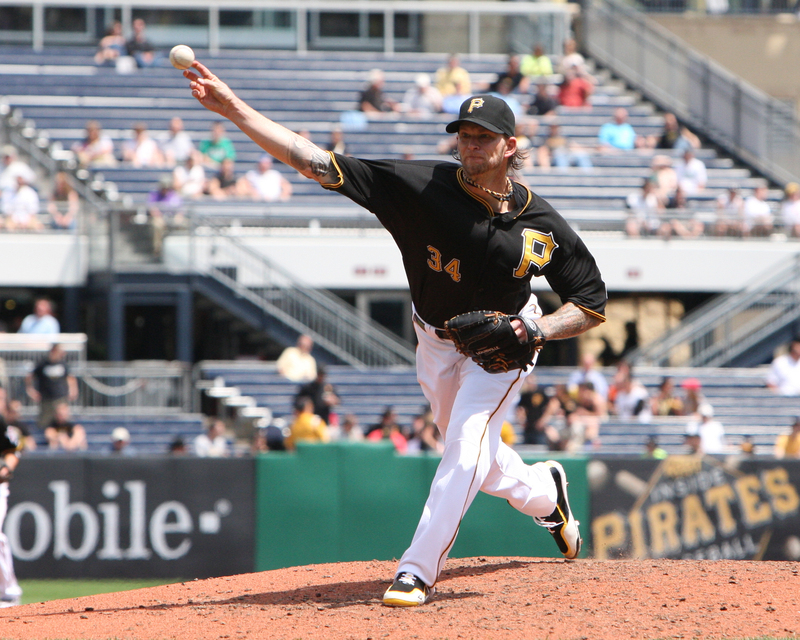 Even Lefty Chris Rusin (tomorrow night’s starter against the Pirates) has pitched well this month with an ERA of 3.03. The Padres have a lesser starting staff with only Ian Kennedy potentially being a major problem for the Pirates, but San Diego historically plays well in PNC Park having won 10 of the last 11 series played there. So the Pirates have to be extra careful and not get lax with that team. Finally, we have the Red. With Bailey, Latos, Leake, potentially Cingrani (who currently has a back issue) who throws as hard as Gerrit Cole. Even a fading Bronson Arroyo can beat you with their powerful hitting lineup (Ludwick is back) And The Reds might even make hard throwing lefty Aroldis Chapman a starter against the Pirates for the upcoming series. ALL of these starters have given the Pirates fits at times, so they will have to pitch their BEST if they want to win the division. In every way that matters, the PLAYOFFS begin tomorrow night. Good teams/bad teams/so-so teams…It’s pretty simple: You just have to win more than the other contenders. Here’s my gripe: Cincy has 3 off days in Sept, the 12th, 19th and 26th – all Thursdays (What, the Redlegs didn’t want to play but one game on Thursday in September this year?) The Bucs have 2 offdays but they are 3 weeks apart – Sept 5th and 26th. Doesn’t seem fair to me given how off days late in the season are more important to a tired contending club than the opponent next on the schedule. Cards have 2 Sept off days – the 9th and 26th. Not quite as bad as Bucs but still I see the Reds as having a big advantage with those 3 weekly off days. Comments? Well the Pirates have four more wins now than they have had the previous 20 seasons. It might not be an overnight thing for people to consider them a good team. Watch this, last September the Reds went 5-1 against the Pirates. 7-2 if you include August. We were 1-5 against them at GAB in that time. The Cubs swept the Pirates at PNC last September and went 5-2 against us that month. The Padres went 5-1 against the Pirates last August/September. In 2011 the Pirates were swept 7 games in a row at home by the Cubs and Padres in August. This is why people are negative. This is why people think bad things are going to happen. Because in very recent history, they have. Excuse us for not being ignorant of the past two seasons. IMO it’s impossible not to, even if it is somewhat illogical to do so. The scars of the 20 years and the past two copllapses don’t heal with one great season for a lot of fans. That doesn’t mean I want the Pirates to lsoe, it just means I feel like the rug is coming out any day and this is all one big trick being played on us yet again. Well put! I have felt that way for awhile but had trouble putting it in the right words. As positive as I want to be I can’t believe it till the team proves it to me that the past is the past. Lets face it, 9 out of 10 times the team that gets hot in September in both leagues usually ends up playing for it all. So limping into the playoffs won’t cut it for the long haul. I think the problem with this is taking what happened to previous teams and applying it to this team. The last two years didn’t have Russell Martin, Francisco Liriano, Gerrit Cole, Marlon Byrd, Justin Morneau, etc, etc. The only consistency is the name of the team. Even in the 70s, when we were winning consistently, there were always the “no chance we beat them” attitude. There was NO way we could ever beat the Orioles!! I think it is natural to feel that way. the incredibly sad thing is, that even if the pirates make the playoffs this year, win the division this year, its going to be the exact same way next year. just look at the orioles. no one coming into this year thought that they could repeat what they did last year, especially in maybe the toughest division in baseball…but they basically are. its incredibly difficult to be fluky over the course of a 162 game season. thats why the pirates the last two years havent been able to sustain their hot starts. thats why sabremetrics work in baseball (see jeff locke). because over such an incredibly long season, things tend to even themselves out. I wouldn’t say I have optimism about the team. I’m just looking realistically at a team that is objectively one of the best in the National League. I think for years people assumed the only way the Pirates could win is if everything fell into place and they lucked into it. So now that they are winning, I think people are assuming that’s the reason. I think you could also point to the Nationals. Great team, great farm system, yet I’ve seen a lot of people use them as an example of how competing isn’t guaranteed every year. Granted they probably won’t make the playoffs, but they will be the 6th-7th best team in the NL. You’re not going to make the playoffs every year, but the goal should be having a shot at the playoffs each year, and having a good team. I feel the Nationals have that.